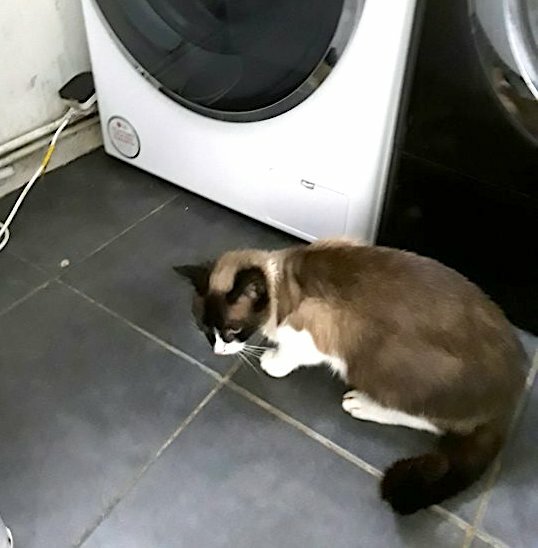 Jackie Mullens’ Siamese-mix cat, Gracie, had jumped into the washing machine for a snug snooze unbeknown to Jackie who had just returned from the gym and thrown her clothes into it. She had also put some bedding in which may have attracted Gracie. She started the machine and eventually heard the muffled cries of her cat. We aren’t told how long the machine was on. It was set to a short wash of 20 minutes. It was on long enough for Gracie to get sopping wet. She turned off the machine and recovered Gracie. She immediately rushed her to the veterinarian in Pontypool where she was warned that Gracie might not survive. Gracie spent an overnight stay at the vets on a drip. The bill came to £500. Gracie made a full recovery but is frightened of washing machines. “I recognised the cat cry immediately but I couldn’t work out where it was coming from. I checked outside to see if she’d it was one of our cats in the garden, I was looking everywhere. Suddenly I realised it was coming from under the counter top – one of them was in the machine – but I didn’t know which one. Both Gracie and Jackie were lucky because as she said, if she had gone out after putting on the machine there would have been a different ending. This entry was posted in cats in emergencies and tagged cats in emergencies by Michael Broad. Bookmark the permalink.